How do audio reviewers keep finding exciting new brands and interesting devices from promising manufacturers? Like everyone else we scour the web, check what other reviewers are up to and sometimes get contacted directly. In the case of Slovenian company Erzetich Audio, two things coincided. First I saw a photo on the web and afterwards I found the same machine featured in the 6moons newsroom. 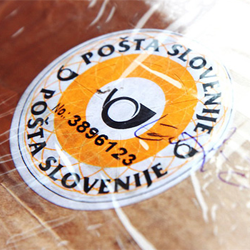 Now I contacted owner Blaž Erzetič (his name explains the brand name) and asked for a review sample. Erzetič answered immediately and promised to send out a unit but asked for a little patience. He wished to dispatch his latest Perfidus which wasn't quite ready yet. What Slovanian and Polish brands have in common is that you hardly find reviews on them in the international hifi magazines. I think that this will soon change. The 21st century is the age of web-based magazines which give small companies well off the mainstream a much better chance at getting reviewed. We don't need a domestic distributor, we don't need new manufacturers to pay for ads – all we need is a product for review. The strengths of such magazines are their readers who demand honest reliable reviews and coverage of novelties that were just introduced. The magazine remains responsible for the first part but the latter is up to the manufacturers. Erzetich Audio was unlikely to score an early review in a print magazine because their operation is based on direct sales without distributors or dealers. What you're reading now is in fact the international début of the brand. 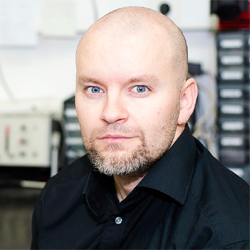 Blaž Erzetič: "Despite having studied electronics and being involved in sound for almost 25 years, my professional career went mainly into a visual direction. Since 1998 I've been working as a designer, illustrator and photographer. Beside sound those also are the topics I teach at the Slovene universities of Arts and Natural Sciences. As a musician I have released 4 albums, one on the US label Wampus Multimedia, two with the German label Black Rain and one on my own label Neversun. "That got me even further in touch not only with music but also the sound engineering aspects in the studio and on and off stage. I've worked as freelance designer since 1999 and in February of 2012 expanded into the production of electronic devices under the Erzetich brand. "Merging my knowledge of electronics, acoustics and design, I created three headphone amplifiers which for timeless and unobtrusive design were featured in many design webzines and blogs around the world—USA, China, Greece, Russia and Poland—including Yanko Design and Delood. My Bacillus is an AD8066 op-amp based amplifier with a 250mA current buffer at the end so the op-amp is unloaded from the headphones to exhibit no nonlinearities. The input capacitors are Wima KPT and the final sound is slightly bright. 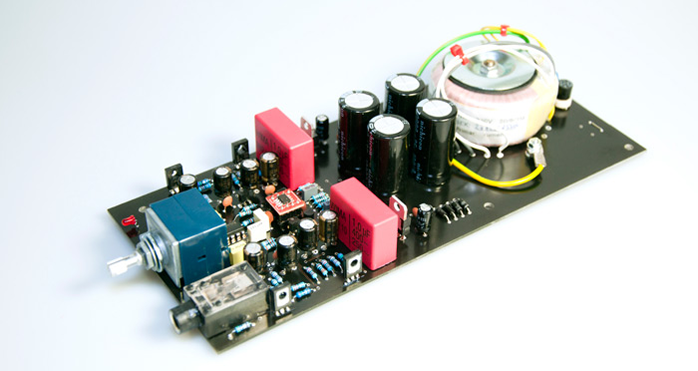 The Bacillus tilia is an OPA627 op-amp based amplifier also with a current buffer. It uses Obbligato Gold Premium input capacitors and this combination makes it smooth and neutral. Perfidus is a class A amplifier with discrete transistor current buffer whilst the input stage uses an OPA627 op-amp with Wima capacitor. "Headphone amplifiers are still not as popular as they should be. I find it absurd that people buy €500 studio headphones and plug them straight into a portable MP3 player. That's like driving a Ferrari on a gravel road. Big studio headphones need power that a portable player (not even a sound card or built-in headphone output of a CD player) can't deliver. The difference is obvious once a dedicated headphone amplifier is used: strong bass, clear sound, less distortion, better soundstaging etc. 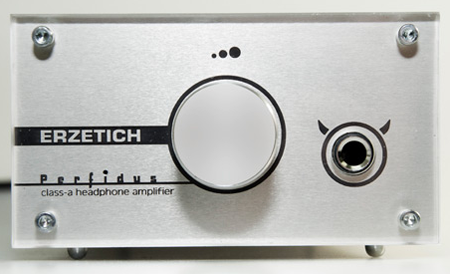 "Erzetich headphone amplifiers are small power amplifiers with a double power supply and one single high-quality input coupling cap in the signal path. Our power supplies are embedded in the chassis to make the amplifiers compact and simple to carry if needed. If you see a single power supply headphone amplifier (usually with an external wall-wart transformer) that spells trouble. It needs a big output capacitor which also means very undesirable signal shaping. I wish more people were aware of that. All our components are of high quality: Alps potentiometer, Wima or Obbligato input capacitors, Burr-Brown ICs, OFC silver-plated wiring. 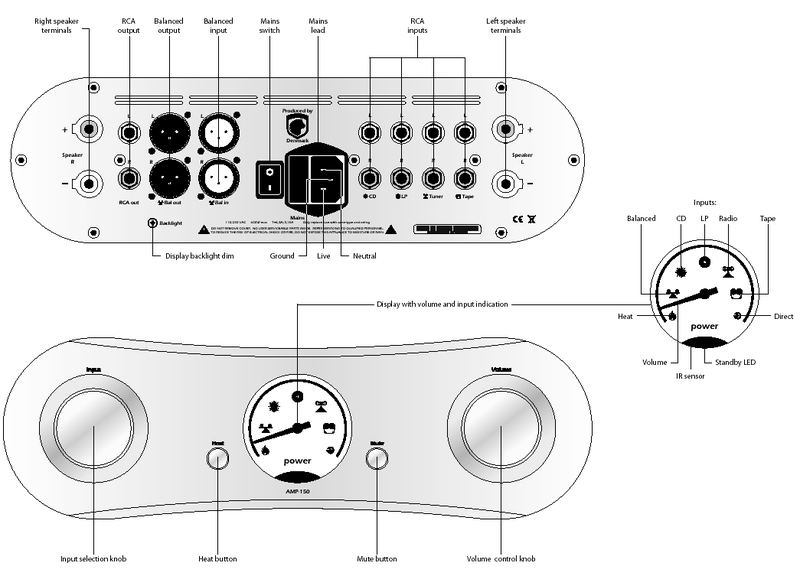 All units are individually handcrafted and tested to create additional value. Because we sell direct, we can keep prices reasonable for our kind of quality. 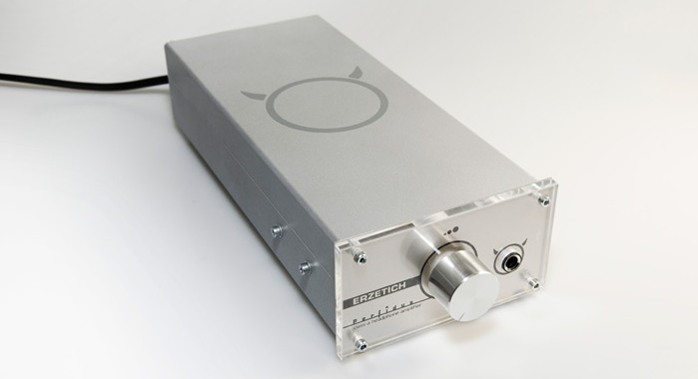 "There's a fourth hybrid headphone amplifier on the books based on input tubes and output transistors. It's still unclear when it will hit production but hopefully this year. Since we are just starting out, we must first promote our brand and products with great quality for good prices."